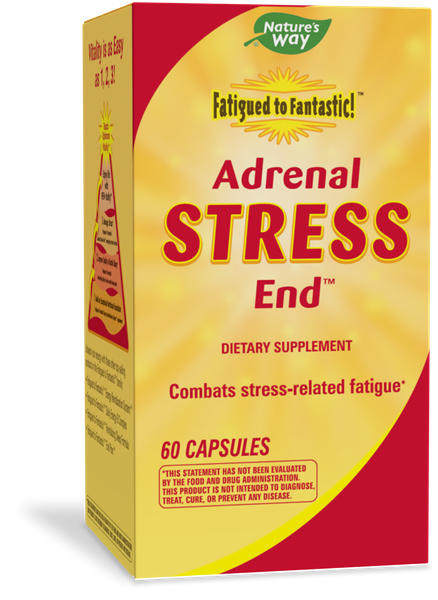 Fatigued to Fantastic!™ Adrenal Stress-End™ / 60 caps - Nature's Way®. The adrenal glands (there are two) are part of the endocrine system. They secret hormones which help the body cope with stress. Do not use this product if pregnant or nursing, have high blood pressure or cardiovascular disease. Do not exceed recommended dose unless advised by a healthcare professional. If you are taking any medications, consult a healthcare professional before use.